Not long after my amputation, at age 29 after living with a limb difference since childhood, I decided to get involved in the limb different community. 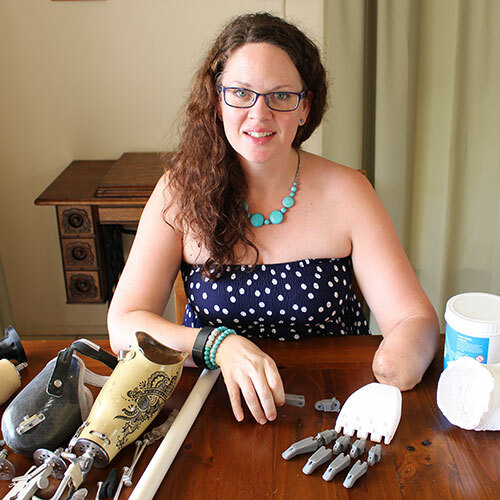 I joined to find out more about living with a limb difference, later on it also became an opportunity to share the 1-UP one hand hair ties I make with other limb different people. At the time I was living in the United Kingdom and joined the Reach Charity and the Limbless Association. On my return to Australia I became aware of Limbs 4 Life and its great work across all of Australia. While being interviewed for the Thrive Summer 2015 edition, about my experiences with the Disabled Surfing Association, I heard about the Limbs 4 Kids peer support training and signed up for the next session. I thought it would be a great opportunity to give back and be of service to kids, parents, carers or medical professionals that have questions about being limb different or are looking for help to adapt. I think I have continued to be involved in limb different groups because I know the value of being able to speak to others who had already been through a similar experience. After my amputation I got in contact with a childhood friend who had gone through amputation at 18. After limb loss you realise that there is more than just having to adjust to physical changes; talking to my friend helped with my mental recovery. By being a Peer Support Volunteer with the Limbs 4 Kids community I look forward to talking to people and sharing my experience. I hope that after speaking with me they take away a pinch of courage, a sprinkle of creativity and a chunk of self-belief that will inspire and empower them to take the next step in their journey.